Looking to buy a rv? RVParkStore.com has 5 rvs near Milford. Chariot Eagle Park Model 464 with front bunks, 2 bathrooms, and rear queen. Chariot Eagle Park Model 747 with loft, kitchen open into large front living area, fireplace, rear queen. 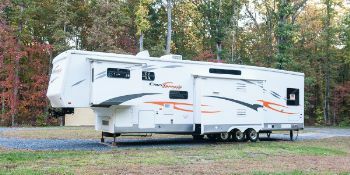 Sportsmen travel trailer with power tongue jack, rear kitchen, front queen, 1 slide-out. Chariot Eagle Park Model 486 with front kitchen, rear queen, center living room and bath.